This bed was started last Spring. First we did some deep tilling (with rototiller), then we installed the boards and evened it up. 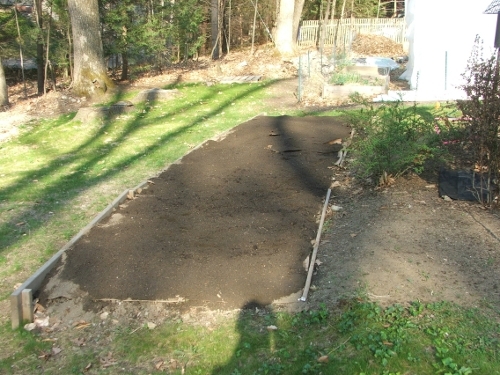 We added a thick layer of compost and loam and sowed two rounds of buckwheat on it. 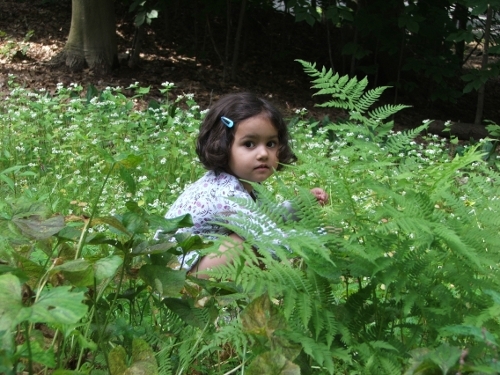 Below is a picture of Amie in the buckwheat, July of last year. We tilled in the last buckwheat in September (before it went to seed again) and followed it up with a season of winter compost (fava, vetch, wheat and rye). Yesterday, in 90F weather, I forked in what overwintered of that winter compost mix (a rather pathetic sprinkling of mostly fava), along with a dusting of limestone and some MooDoo. The soil was at least a fork deep and very light and fluffy, and full of critters. Good stuff.� I am so happy I took my time, and gave it time, to build up and mature. I raked it even and covered it with cardboard. In the picture you see, in the background: the hoop house, the garlic bed (which is so fragrant now – I love “tidying” it up), then the fence, then a pallet. On that pallet the� beehive will sit. I only mention this area because that’s where all the cardboard was headed on a gust of wind. Run! 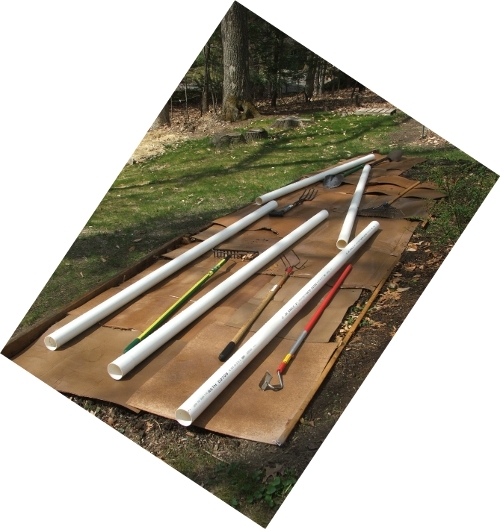 Okay, I found an intermediary use for all the big pvc pipes that� will sometime go into the ground for our rain water catchment system. Then I wet the whole thing down and covered it with about an inch of sifted loam, with a little MooDoo mixed in. That bed looks good enough to take a nap in! 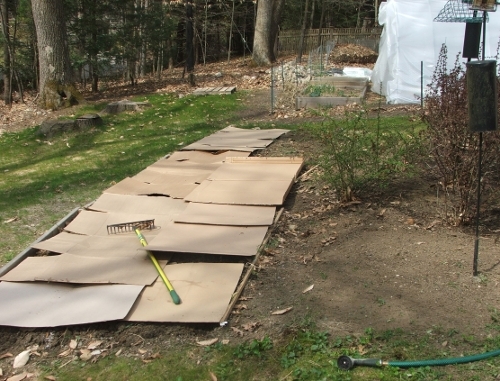 Come planting time, in a few weeks, I will cut X-s into the cardboard – if it still hasn’t broken down – and plug in the herb transplants I am growing in the basement. The idea with the sheet mulch was� (1) to keep the weeds from taking over the bed and (2) the soil from eroding and/or compacting under rain while it sat in its very sparse clothing of fava seedlings. And (3) to give it one last boost of soil building activity by inviting the worms to dig in the cardboard. I want to do this to the five beds (four of them 4′ x 8′ and one 6′ x 8′) that terrace the slope up front, which will become home to strawberries and several more herbs.